Shiva appears in many forms. The abstract form of the lingam (sanskrit for mark or sign) helps us concentrate on the mysterious nature of Shiva, that is beyond comprehension or representation. The lingam reminds us of the presence of God within all of creation, and within us all. Then there is the canonical form of Shiva, meditating with the moon in his hair, holding the trident and drum. This is often seen as the canonical image of Shiva the Mahadeva, the great God. Another common representation of Shiva is the Nataraja, Shiva as the Lord of the dance. 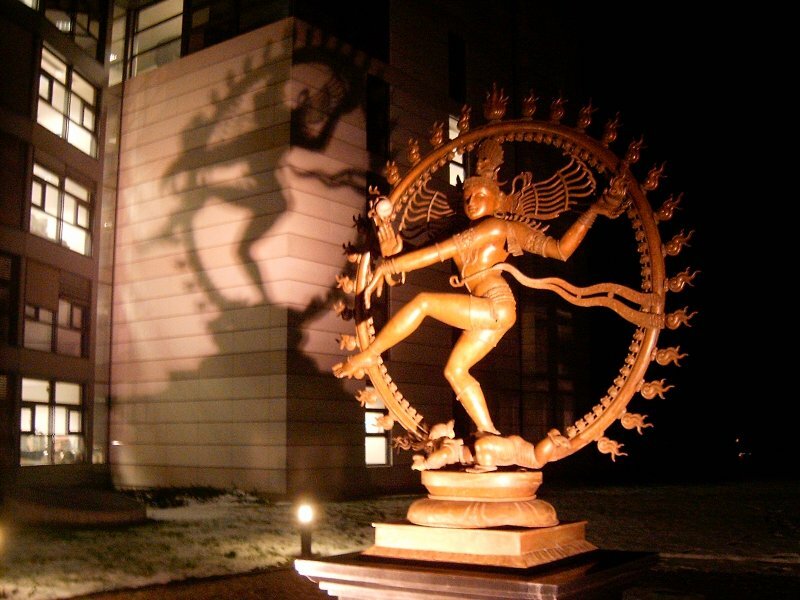 Here Shiva is seen dancing the eternal dance of creation and destruction. He dances on the demon dwarf, Apasmara, who represents ignorance. These three representations of Shiva are probably the most common, but they are far from the only images. Shiva also appears as Ardhanari, an androgynous composite of Shiva and Shakti together in one body. This form reminds us that God is beyond gender, yet encompasses both genders. 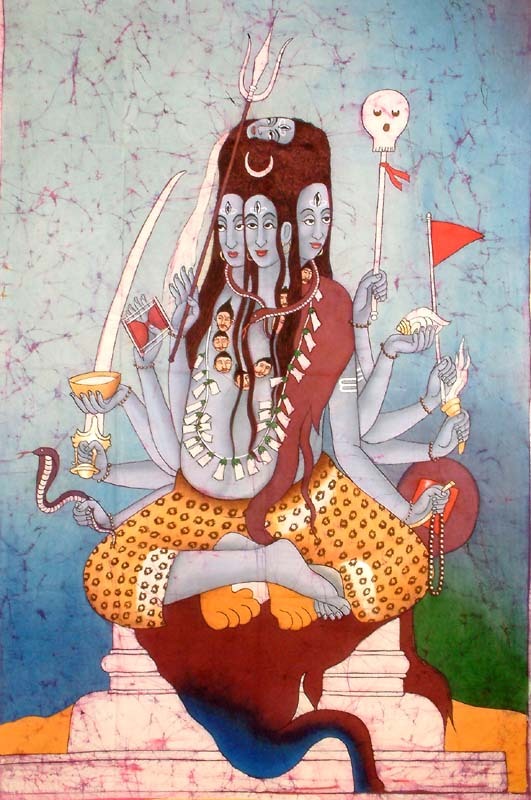 Another composite form is Harihara, a combined form of Vishnu and Shiva. This reminds us that there is one God, with many aspects. When we sorship Shiva we are also worshiping Vishnu, Shakti and all possible manifestations . The worshipers of Shiva should not see those who worship Vishnu as any less, neither should the followers of Vishnu look down on those who follow Shiva. All followers of Sanatana Dharma (Hinduism) are looking for the divine. When one fully realises the true nature of God and of ourselves we will realise that we have all been approaching the same mountain top from other directions. This is expressed well in the Shiva Aarti. Meaning: Being the Absolute, True being, Consciousness and Bliss, you play the roles of all the three Gods – Brahma, Vishnu and Shiva. As Vishnu, you have but one face, as Brahma four and as Shiva five. They gladden the sight of all who behold them. As Brahma you prefer the back of the swan for your seat, as Vishnu you like to ensconce yourself on the back of Garuda (A large mythological eagle – like bird believed to be the vehicle of Lord Vishnu) and as Shiva you make the sacred bull your conveyance; all these stand ready. O Great Lord, pray rid me of my afflictions! Tinon Roop Nirakhta Tribhuvan Jan Mohai. Pranvakshar Ke Madhye Yah Tinon Eka. Meaning: Says Swami Shivananda, “He who recites this Arti to the Lord of the three gunas-sattva, rajas and tamas – attains fulfillment of his heart’s desire”. O great Lord Omkaara, may you rid me of my afflictions. Another form of Shiva is Bhairava, the fierce form, the annihilator of evil. Bhairava relates to Shiva as Kali relates to Parvati. This is the form that Shiva takes when there are demons to destroy. 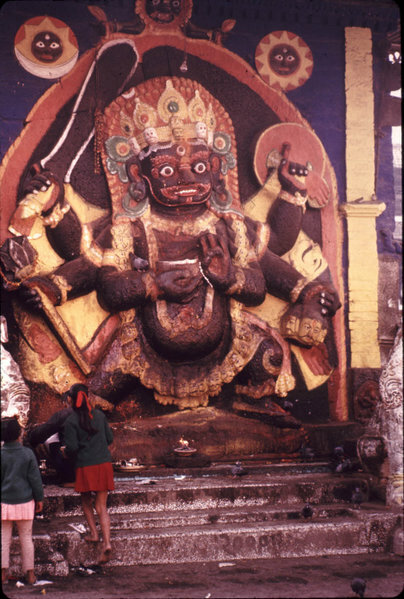 As with Kali and Parvati, Bhairava should be seen as tough love. 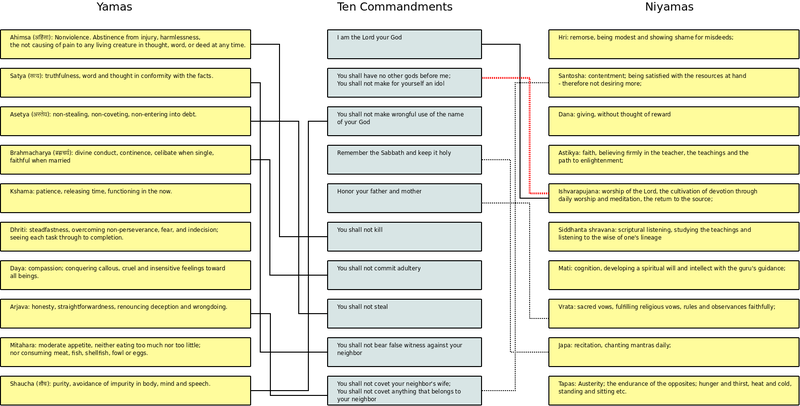 Sometimes we need hard lessons to further our spiritual advancement. Also, anhialation is necessary for creation, everything in conditioned reality needs to come to an end so that more can be created. Even the universe has cycles of destruction and creation. Isana faces south-east and represents the Ishwara aspect of Shiva known as Sadashiva or the Eternal Shiva. Tatpurusha faces the east and represents the deluded purusha or ego aspect of Shiva. Aghora faces south and represents the destructive and regenerative aspect of Shiva, that like fire, first devours life and then prepares the ground for its renewal. 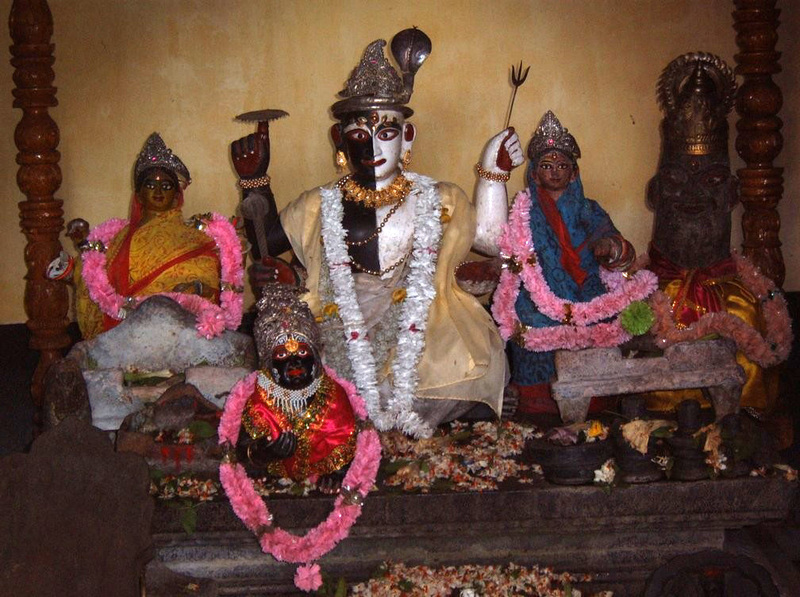 Vamadeva faces north and represents the healer and preserver aspect of Shiva. Sadyojata faces west and represents the creative power of Shiva. Some of the images are quite small in this article. 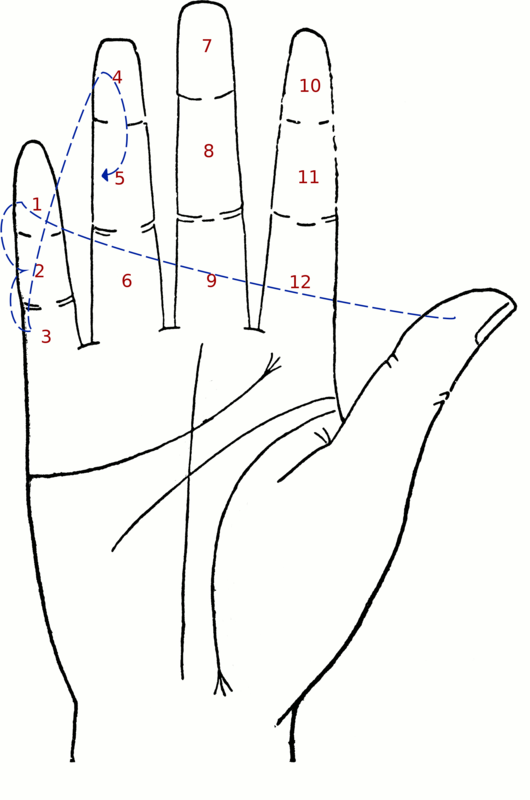 Click on them to see a larger image. This entry was posted in hinduism, religion and tagged god, harihara, hindu, one God, shiv, shiva, vishnu. Bookmark the permalink. read yourr piece on Shiva.i want to share my experiance with you , i live in new delhi, and joined DHYAN FOUNDATION 3years ago, and the word SHIVA, has since taken on a whole new meaning.I feel blessed by YOGI ASHWINI, our Guru and guiding light .We feel all blessed and to share our blessings we do workshops in which we teach SANATAN KRIYA, we are about to do one such workshop at Dracut, Boston, and the info is on http://dhyanfoundation.blogspot.com do help us reach out to people so as many can benifit as possible, with this humble request , thank you. I edited the link in your comment which was missing the “:” after “http”. I will look at your site later when I have time, it looks good. Thanks, that is a lovely statue. Interestingly Shiva is holding the axe, rope and bowl usually and bowl usually associated with Ganesha. This is a powerful reminder that Shiva is also ultimately the power behind Ganesha, the remover of obstacles. Shiva is the one who is associated with the Bowl.This form of Shiva is known as Bikshaadanar. [sanskrit] and Pichaandar or Pichandi in Tamil.The bowl is a Begging Bowl.and Shows Shiva as the eternal ascetic /mendicant. Ganesha does not have the bowl[not to my knowledge]unless it is filled with Modhakas. 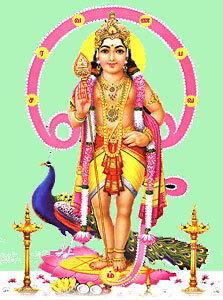 ;also probably because he is also associated with prosperity/Lakshmi. who else to ask but the most contented Lord to destroy our discontent!. 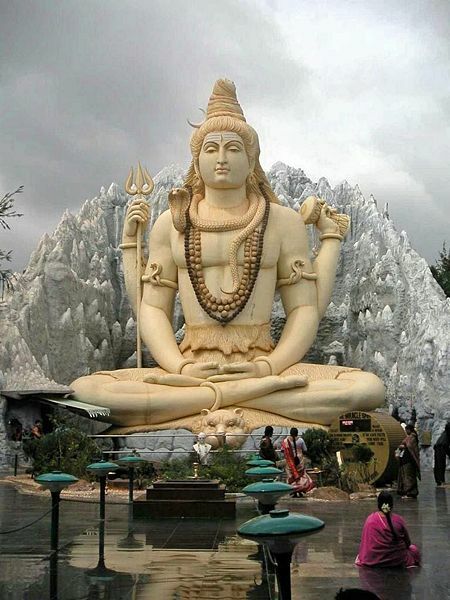 The best that a web site provide information about LORD SHIVA. Shiva is every where . shiva is every thing. No body can reasch start and end of Shiva. Jai Jai Jai, Jai Bhagwan Bholay Shankar. Lord Siva Help me to Succes in my life………. Figuratively speaking, as Chris says, we are all children of Shiva. But literally, claiming to be Shiva’s son is quite absurd unless your father is himself the Great Yogi of Yogis. A true son of Shiva is always a Manas-Putra or Yoga-Putra, i.e. the creation of His spiritual power or mind-force. lord shiva is sampoorna.Thanx for giving information on PANCHANNA .Is this is the roop of shiva ,represent by PASUPATI NATH TEMPLE? 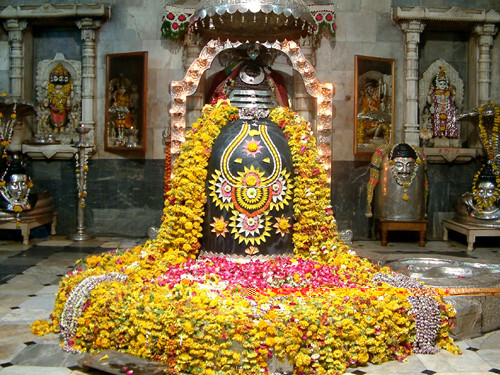 The deity is of black stone, about 6 feet in height and the same in circumference. I assume that he is some form of Pashupati, Shiva as Lord of the beasts. GOD SHIVA IS NOT IN HEAVEN BUT IN YOU:HE NEEDS NOT TO BE PRAISED OR APPRIASED. EVEN YOU NEED NOT TO KNEEL DOWN TO PRAY HIM. IF POSSIBLE TRY TO SEE HIM IN EVERY THING AS HE IS EVERYTHING. I have been doing a bit of research, The Horned God of wicca had the star on his forehead and was shown in a Yogic posture on a wiccan blog. I remember one of the 108 names of God Shiva – Pashupatinath. I do not remember the full story but i remember he turned into a deer and he was known as the Protector of the Animals. The Horned God is Pashupatinath, as the same symbols can be found in Indus/ saraswati valley civilization. Seems like Christianity makes European Pagans look like Devil worshipers, making their God look like the Devil. If you actually look at the imagery of the Devil – he has the trident and horns. I was reading a Catholic forum and they were saying that in the middle ages the Roman Catholic church was “Fighting” the pagan gods. So they were fighting the “Pagan” gods by making their Gods look like the Devil, hence assimilating them in the end after making them afraid of their own original God. Interesting article, nice illustrations. Lord Shiva is the Lord of Yogis. He can be quoted as the perfect one for every aspect, supreme, dance, family-man (yes! ), yogi, innocent (bhola means innocent in Hindi) and it goes on. He is one where all the attributes which are opposite in nature culminate. He is the remover of obstacles, He is the remover of poverty, He is the provider of salvation. He is the only one who can be pleased easily, being innocent. Om Namah Shivaya!